Mark Leslie Hersey, Jr. was born on 8 July 1888 and died on 3 December 1974. 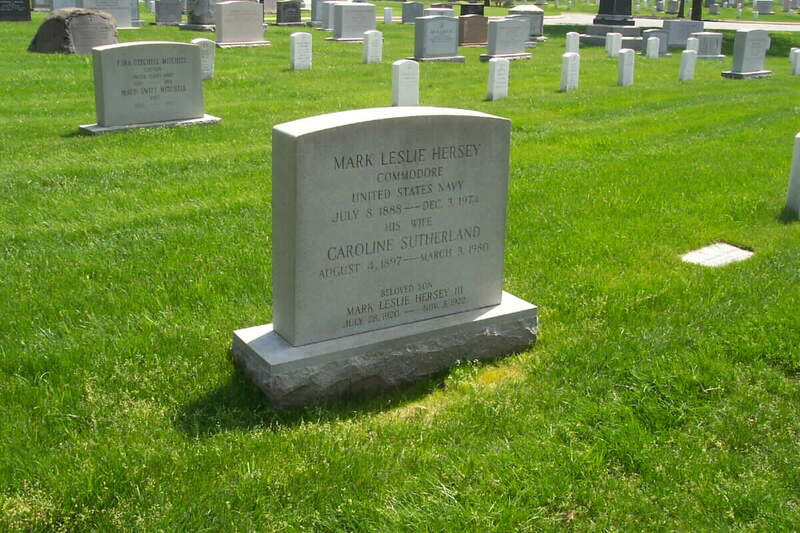 He was buried with full military honors near his father, Mark Leslie Hersey, Major General, United States Army, in Arlington National Cemetery. His wife, Caroline Sutherland Hersey (4 August 1897-3 March 1980), and his son, Mark Leslie Hersey III (28 July 1920-3 November 1922) are buried with him. The Navy Cross is awarded to Lieutenant Commander Mark L. Hersey, Jr., U.S. Navy, for distinguished service in the line of his profession as commanding officer of the U.S.S. Sampson, engaged in the important, exacting and hazardous duty of patrolling the waters infested with enemy submarines and mines, in escorting and protecting vitally important convoys of troops and supplies through these waters, and in offensive and defensive action, vigorously and unremittingly prosecuted against all forms of enemy naval activity. We are seeking additional information regarding these individuals.